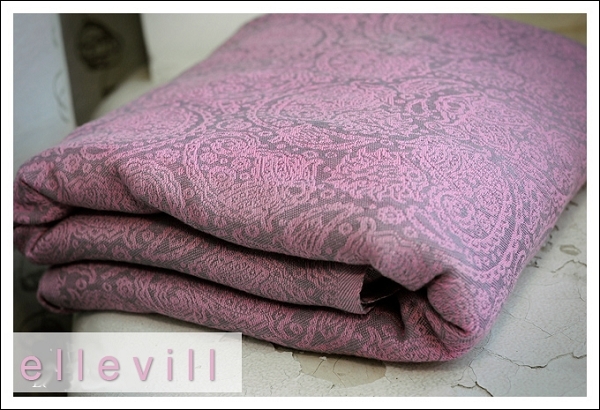 A luxurious wrap from Ellevill in 50% linen and 50% bamboo. Silverpink is two-colored in pink and grey and feels supersoft to your baby's skin. This is a jacquard woven wrap with tapered ends and hemmed rails. Paisley or Paisley pattern is a droplet-shaped vegetable motif of Indian and Persian origin, similar to half of the Yin Yang symbol. The pattern is sometimes called "Persian pickles" by American traditionalists, especially quilt makers, as far back as 1888. In Sanskrit the design is known as mankolam and has long been used in India. It resembles a mango and has sometimes been associated with Hinduism. Some design scholars call the distinctive shape boteh and believe it is the convergence of a stylized floral spray and a cypress tree: a Zoroastrian symbol of life and eternity. The modern French words for paisley are boteh and palme, the latter being a reference to the palm tree, which, along with the pine and the cypress, is one of the traditional botanical motifs thought to have influenced the shape of the paisley element as we now know it. In Pakistan, paisley designs are widely termed the carrey design. Carrey in Urdu means mango seed.